On Monday, the Environmental Protection Agency put forward plans to, by 2030, cut carbon dioxide emissions from power plants by 30 percent from 2005 levels. Putting aside the climate implications of the announcement, it will be interesting to see the wording used by Democrats and Republicans in framing the issue. Last week, Yale University released a study showing that people are more likely to fear “global warming” and take part in a campaign to stop it than they are “climate change.” Yale’s report echoed research by George W. Bush pollster Frank Luntz, who had argued that the Bush White House should use climate change instead of global warming because it sounded less scary. Polling also shows Democrats are more likely than Republicans to believe the Earth is warming and human activity is the main cause. But Democrats and Republicans in Congress don’t see seem to be heeding the pollsters’ advice. The Sunlight Foundation’s Capitol Words website tracks the number of times words or phrases are used in the Congressional Record and by which party. Here are the number of mentions each year since President Obama took office (I prorated the 2014 figures based on the number of days the Senate has left in session). Cumulatively, from 2009 through Tuesday, Republicans mentioned global warming 1,338 times and climate change 1,243 times. 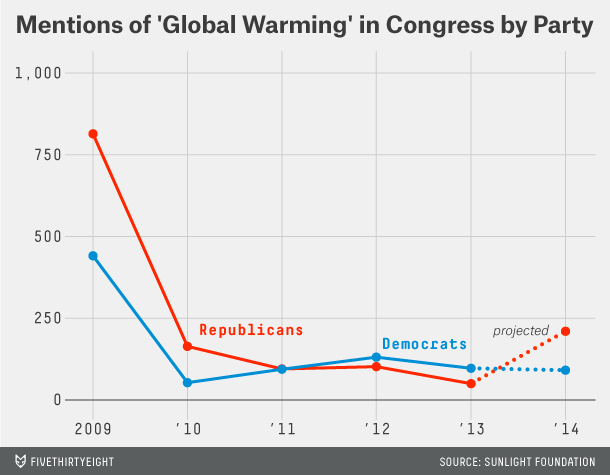 Democrats mentioned climate change 3,584 times and global warming just 865 times. This seems to fit the opposite of what the pollsters suggest should be happening, yet it’s a pattern that matches what we’re seeing on cable news as well. I searched the Internet Archive’s database of TV news transcripts for “climate change” and “global warming” since 2009. (You can search here). MSNBC, which is most watched by liberals, has used climate change 3,981 times, with “Hardball With Chris Matthews” and “The Rachel Maddow Show” using it most. Fox News, which is most watched by conservatives, has used it 2,946 times, or about 1,000 fewer times than MSNBC. Meanwhile, global warming has been used 3,318 times on Fox News (“The O’Reilly Factor” and “Hannity” used it most). MSNBC has only used it 1,959 times. 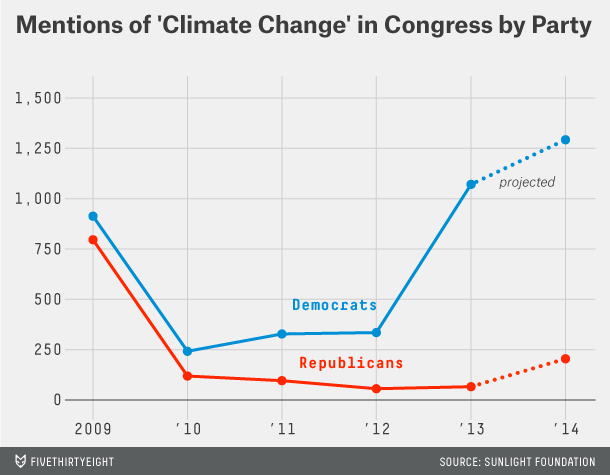 So, why are Democrats using climate change more frequently? That’s a difficult question to answer, but part of it may be that they are trying to draw attention to the larger implications of a warming planet. Many people use the terms interchangeably, but climate change usually refers to the broader effects brought on by increased greenhouse gases, such as a rising ocean. That’s why NASA and the vast majority of the scientific literature uses the phrase. The idea of man-made global warming, on the other hand, may be more easily attacked from a rhetorical angle because it’s singular. One might use the logic, it’s cold outside, therefore global warming can’t possibly be happening. Inhofe followed this line of reasoning in January, when pointing out that the cold winter in the East (even as most of the planet was baking) was a sign that man-made warming is a hoax. He also pointed to political events about global warming that took place in cold weather. It’s more difficult to make that argument when we start talking about rising oceans.